Note:In India, Mine Jeffrey Inc.'s top customer is Hyderabad Industries Ltd., the country's largest manufacturer of asbestos-cement sheets and corrugated roofing. Baljit Singh Chadha is Jeffrey Mine's exclusive agent in India. The Mumbai -born, Montreal-based Chadha, whose Balcorp Ltd. is a $100 million (revenues) international trade and marketing company, is a member of the Queen's Privy Council and has been JM's representative for two decades. "You have to look at it from the point of view that people didn't have a roof over their heads," he says. "With a little bit of economic development they were managing to have a shack with a roof over their head, and this was the most practical thing that was available." If the product's growth continues on its current path, Chadha predicts that India's asbestos usage could grow to 500,000 tonnes a year from 300,000 currently. in a news report dated 27 December, 2009. The death toll from mesothelioma, a rare cancer almost always caused by asbestos exposure, is rising rapidly in Mexico, a major market for Canada's exports of the mineral, and could be as high as 500 a year. The figure – an estimate by doctors at the Mexican Institute of Social Security, a government health agency – is likely to spur further controversy over Canada's aggressive promotion of the cancer-causing material in the developing world. Concerns over asbestos were a focus of attention during Quebec Premier Jean Charest's recent trade mission to India. He defended the mineral, which is mined in his province and supports about 700 jobs. Guadalupe Aguilar, an occupational health expert who led the team that conducted the research, said the full impact of asbestos may be even greater because medical surveys have found that for every mesothelioma death, there are likely an additional 2.3 fatal cases of lung cancer due to inhalation of the mineral. The total number of asbestos caused deaths in Mexico is probably around 1,500 annually, Dr. Aguilar said. Developing countries use asbestos as an additive to strengthen cement. Critics of the asbestos industry contend the Mexican findings call into question the federal and Quebec governments' view that the mineral can be used with little risk, and suggest an even higher health toll because Canada exports it to many other countries. “The evidence is clear that chrysotile asbestos around the world is causing devastating health impacts,” said Kathleen Ruff, senior human-rights adviser at the Rideau Institute, a left-leaning Ottawa think tank. The federal government said the new research doesn't alter its view that asbestos can be used safely, and that it is tightly regulated in Mexico. “The risks associated with its use can be managed under controlled conditions. Banning chrysotile is neither necessary nor appropriate,” Natural Resources Canada said in a statement. It contended the Mexican deaths were due to past uses of asbestos that are now prohibited. The Canadian position is also at odds with the World Health Organization, which says no known safe threshold exists for asbestos exposure, and the most effective way to eliminate the health hazard is to stop using it. Asbestos is considered so dangerous that some provinces, such as Ontario, limit exposure to a maximum of one dust-like fibre in 10 cubic centimetres of air, something that requires highly sophisticated monitoring and ventilation equipment. 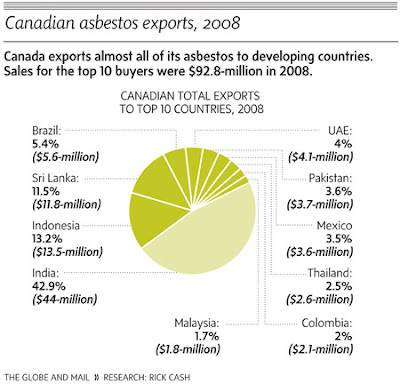 Because of health and litigation risks, Canada doesn't use much asbestos. About 95 per cent of Quebec's output is exported, virtually all of it to the developing world. Canada is a dominant seller in Mexico, accounting for about one-third of the market in 2008.